?villa didaar? by local architect behzad atabaki is located in an area where the caspian sea and the green mountains of northern alborz, iran, meet. the main objectives of the architect were creating a fluid and transparent connection between the sea view and the green landscape, as well as interconnecting the interiors while having separate and defined spaces for a large family to rest and feel cozy, plus an immediate connection with the environment outside. 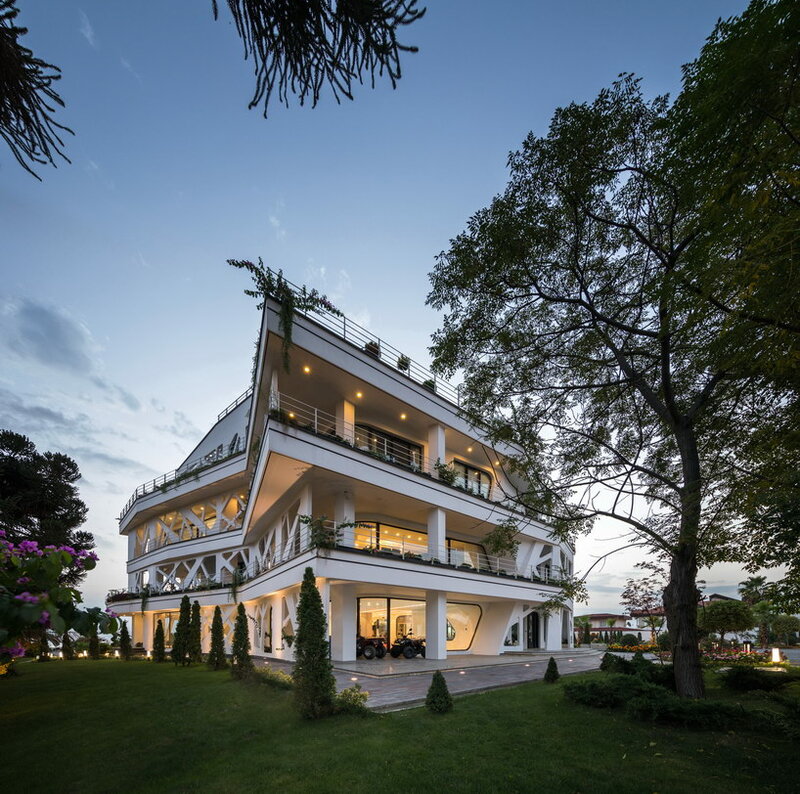 therefore, the large villa has been designed in three separate sequences, which slide on each other in a free and independent way, while keeping the unity of the entire building as a whole. the ground floor, which redefines the concept of piloti, has an interior swimming pool stretched along the sea view that brings the sea closer. the stacking glass walls and the glass covered void on the ceiling above, not only allow a smooth continuation and fluid vision through the forest towards the sea, but also provide natural ventilation by the free circulation of air through the building. each level is surrounded by wraparound terraces, which are covered on the west side by a tree-like lattice, that provides a shelter from heavy west rains in the humid climate of northern iran, while conveying a feeling of privacy and coziness by creating a shady half-closed space.